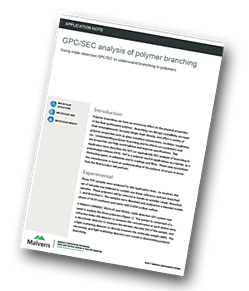 Malvern has produced an application note describing the GPC (or equivalently SEC) analysis of branching in polyvinylpyrrolidone (PVP). Polymer branching can have an enormous effect on the physical properties of the final synthesized polymer. Branching can disrupt crystallinity, increase chain entanglements, increase single chain density, and affect a variety of polymer properties such as glass transition temperature, modulus, toughness, etc. Understanding polymer branching and its effects on a polymer’s enduse properties can help avoid failures and improve specifications. This application note describes the GPC (or equivalently SEC) analysis of branching in polyvinylpyrrolidone (PVP). PVP is a polymer used in applications as a binder, as a thickening agent, in adhesives and in coatings and films. These uses necessitate the manufacturer to have an understanding of the polymer structure to know how the final product will perform. Three PVP samples were analysed for this application note. As received, this set of samples was believed to contain one linear reference and two branched samples. GPC/SEC provides an effective method of determining the presence of polymer branching. By combining the data obtained from the viscometer detector (IV) and the light scattering detector (absolute MW), information regarding the type of branching can be discerned. In addition to branching information, GPC/SEC provides a wide variety of molecular properties including MW, dispersity, solution viscosity, and hydrodynamic size. This collection of information gives a thorough portrayal of the analysed polymer and provides numerous avenues for correlation to the end-use properties of the polymer.